You think running is easy, right? Running just involves heading out and putting a foot in front of the other to help yourself run. Although running can be touted to be the most natural sport of mankind, yet technology and gadgets can improve running by a big way. Any runner will tell you that there is one thing which is loved by a person who runs on pavements and that’s love of data. It is when you can monitor your own form and know how fast, how far and how close you are to your personal best, you’re running is one of the best ways in which you can understand the after effects on training. When you can identify the areas where you need to improve, you will probably evolve as a better runner. 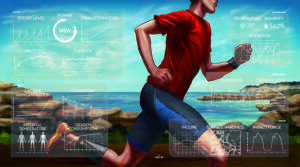 So, let’s take a quick look at the different gadgets that should be used by a runner. If you’re a runner by profession or at heart, you should definitely have the Flipbelt. Amidst a competitive market which is filled with apps, statistics and data tracking, FlipBelt is few of the simplest kit around and at the same time it is also very effective. Once you pull that fabric, which is stretchy around your waist and fill the belt with few important things like credit card, phone and energy gels, flip it over and wear it. With the help of the buckles and straps which are adjustable, the belt sits tight on the body. If there is one thing which a runner loves, then it is a 2-in-1 device which has the capability of saving space and which is called Shapeheart Armband. You may need to carry your smartphone while running due to different reasons like taking calls or listening to music but don’t you think that holding it in your palm will make the process difficult? This is when you may need armbands as they let you keep your phone tied to your arm. You may even get armbands which have an HR sensor located to read your heart data. During winter, don’t let the cold control you and keep you on a treadmill for 3 months. At the same time, you shouldn’t fall while running on the ice. How about getting Yaktrax and attaching them to your running shoes so that you could get a grip on icy trails and snowy roads? This can ensure safety for a runner during the winter season. It is definitely a good idea to attach some form of ID on your body so that you may know whether or not there is a probability of an impending disaster. Although there are simpler ways in which you can do so, if you wear the ID bracelet, it is made of paracord stringing which can be used as a rope during an emergency. You can also use it as a replaced shoelace in case you have such an emergency. How about buying Jaybird X2 in-ear headphones which are a famous choice for runners? The new Bluetooth buds have similar fan club and they have huge improvements built in them which are also pocket-friendly. Bluetooth 4.1 means longer battery life which can easily work with marathon juice. Therefore, if you’re a runner and you want to make running even easier by leveraging technology, you should opt for any of the above mentioned technology or may be all of them if you think they’re necessary. Machine learning and search engine marketing – How can big data empower marketers?